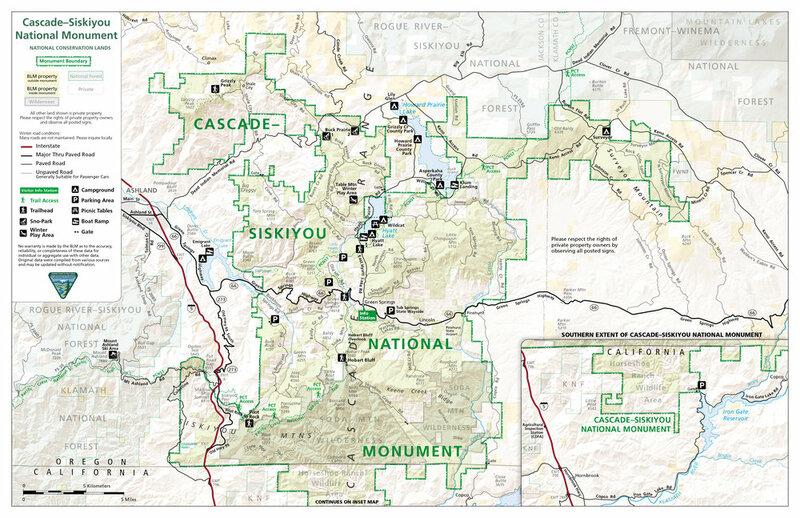 Download this printable map (PDF) of Cascade-Siskiyou National Monument. See webcam views to check the latest conditions at the Monument and through highways. View the weather report from the National Weather Service for Greensprings, OR. The Cascade-Siskiyou National Monument is open daily, year-round. As this Monument was set aside to protect biodiversity, when visiting keep a light impact and practice leave no trace principals. Take only photographs, leave only footprints. Day hikes are on designated trails with wide-ranging terrains suited to hikers of varied experience and ability. Trails are usually snow free from May through October. The Pacific Crest National Trail winds over 30 miles through the Monument. Vehicle routes intersect with the PCT at Hobart Bluff, Pilot Rock, Greensprings and at about milepost 15 on Highway 66. Learn more about the PCT trail. Camping at Hyatt Lake Campgrounds. Make a reservation. Hunting info provided by BLM (pdf). Fishing info provided by Oregon Department of Fish and Wildlife. Buck Prairie & Hyatt Lake Nordic Skiing Map (pdf). Soda Mountain trip planning, images and more. Horseshoe Ranch Wildlife Area recreation opportunities. During summer weekends we have three Monument Rangers at our Contact Station on Highway 66 next to the Green Springs Inn & Cabins. Rangers lead hikes and do evening campfire programs at Hyatt Lake. Stop in at the Contact Station to see visual exhibits; get maps and brochures about recreational information. Sign the visitor book and collect your stamp to remember your visit! If you have any other questions, feel free to contact us! Have a great visit!